What Business Model for Air Mauritius? The turbulence within the national airline Air Mauritius has been terrible over the past years. The recent publication of the results for the first nine months of the fiscal year 2018-2019 is a clear warning that the national airline is in real troubled waters. It is becoming a vexing challenge for Air Mauritius to generate profits. For the period from April to December 2018, the company has incurred losses of Rs 998.2 million against profits of Rs 400.6 million, the same as in 2017. Surprisingly, the losses have accumulated over the quarters, including the high season (October to December), during which travel and tourism operators in Mauritius reap maximum profits. The main reasons pointed by the company are increased competitions and rising costs of fuels. Besides, the 4th quarter is expected to be even more challenging. Experts are asking for a business model that will bring Air Mauritius back on track. To trim down losses, experts are recommending for major changes from general operations to staffing. On 31st January 2019, Mauritius and the United Kingdom signed a new trade agreement that will guarantee continued preferential access for Mauritian products to British soil after the United Kingdom leaves the European Union on 29th March 2019. But will the post-Brexit era open up new opportunities for Mauritius? President of the Mauritian Chapter of the Organisation of Women in Science in Developing Countries (OWSD), Dr Devika Saddul has been helping women for years to integrate the science field in Mauritius. One of Mauritius’ prominent scientists, Dr Saddul’s work as the Senior Research Scientist at the Food and Agricultural Research and Extension Institute (FAREI) promotes sustainable agriculture practices in the island. 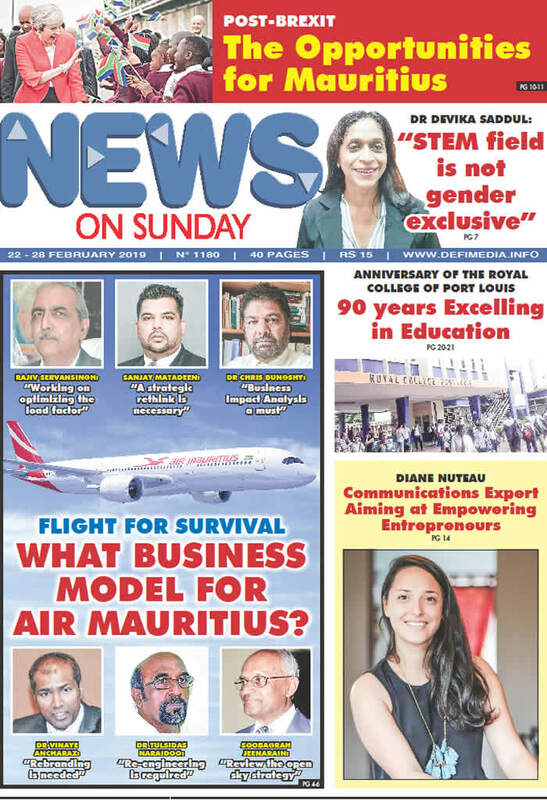 Holder of a Postgraduate Diploma in Applied Science, the Research Scientist is sharing with News on Sunday her views on the contribution of women in science in Mauritius and how to promote STEM among the community at large. With only 140 pupils when this secondary school opened its doors in 1929, the Royal College of Port Louis now welcomes around 715 students and has built a reputation of ‘star school’ through the years. The school marks this year the celebration of its 90th anniversary through a variety of activities that will be organized throughout the school year. Winner of the preceding edition of JCI Young Creative Entrepreneur Award 2018, Diane Nuteau, Communications Specialist, is an epitome of innovation and creativity. She is someone who is ready to go the extra mile to help her clients to achieve their vision. A hardworking woman who is a true example of perseverance and commitment!